The Lajeunesse Lab develops research synthesis tools [ ] and uses laboratory studies to understand the ecology and evolution of parasites and herbivores. Much of the research in our lab is directed towards developing metrics, statistics, and software for ecological meta-analysis. We also aim to address broad ecological and evolutionary questions on the host specificity of parasites and herbivores. Our long term goal is to use laboratory studies on plant chemistry and experimental evolution to compliment this research. Marc is an invited speaker along with Wolfgang Viechtbauer at the [ Evidence Synthesis Hackathon ] hosted by the [ Stockholm Environment Institute (SEI), Sweden ] and organized by Neal Haddaway (SEI) and Martin Westgate (ANU). Marc visits [ CESAB, Center for Synthesis and Analysis of Biodiversity ] in Aix-en-Provence (France) for another GEISHA workgroup meeting about storms impacts to lakes. Our lab hosts [Curt Lively ] for an IB departmental seminar. Meredith presents her Red Queen work at the Ecological Society of America (ESA) meeting in Portland, Oregon. Marc gives a talk at the [Society for Research Synthesis Methodology ], in Montreal, Quebec. Marc visits the [USGS Powell Center for Analysis and Synthesis (Denver, Colorado) ] to collaborate with the GEISHA working group on the impacts of storms in freshwater habitats. The Lajeunesse Lab represents at ESA this year! Jake Zydek and Meredith Krause give talks, and Bryan Macneill presented a poster. Really proud of you guys! Marc gives a departmental seminar at Stony Brook. Our end-to-end research synthesis package metagear for R has been released and getting some nice coverage on Twitter and Facebook! Expect v. 0.3 in mid April 2016! Lajeunesse Lab welcomes a new labbie: Meredith Krause. We're so happy to have you around! Congrats to Jake Zydek and Nick Ogburn for their first conference talks at Evolution 2016 in Guarujá, Brazil. Your hard work is paying off! Our ASN meta-analysis workshop was a success! Thanks to all for participating! Congrats to our undergraduates Bryan MacNeill and Justin Zloty for their awesome posters at USF's Undergraduate Research and Arts Colloquium! 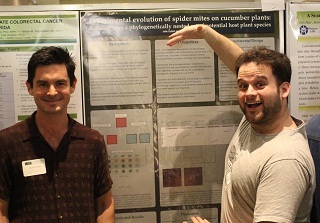 Labbie Jake Zydek (with Nick Ogburn) presents a poster at USF's 7th Annual Graduate Student and Postdoctoral Research Symposium. Congratulations to Thomas Koster for submitting his Honors thesis! Marc attends the last National Evolutionary Synthesis Center (NESCent) workgroup on “Advancing knowledge of evolutionary and ecological immunology” lead by C. Kelly (Université du Québec à Montréal). Durham, NC. Marc co-teaches a course on meta-analysis at [ CESAB, Center for Synthesis and Analysis of Biodiversity ] in Aix-en-Provence (France). Congrats to our undergraduates, Cara Bocon and Bryan Macneill, for their awesome posters at USF's Undergraduate Research and Arts Colloquium. Double congrats to Bryan for landing the Best Use of Library Resources Award! 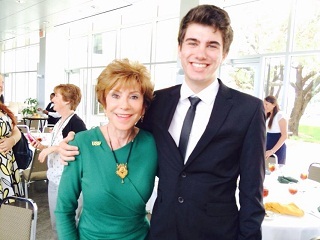 Below is Bryan with USF's president Judy Genshaft accepting his award! Marc attends another National Evolutionary Synthesis Center (NESCent) workgroup on “Advancing knowledge of evolutionary and ecological immunology” lead by C. Kelly (Université du Québec à Montréal). Durham, NC. 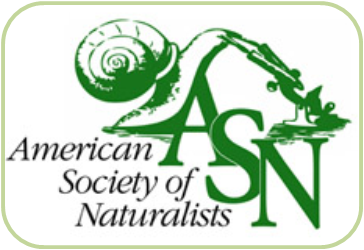 Marc attends National Evolutionary Synthesis Center (NESCent) workgroup on “Working group to solve problems in model selection and phylogeny in mixed multi-factor meta-analysis” lead by J. Hoeksema (University of Mississippi) and J. Bever (Indiana University). Durham, NC. Our Lab hosts "Finalizing and releasing OpenMEE software for meta-analysis” meeting at the Floridian Hotel (Ybor City, FL). Attendees included: Jessica Gurevitch (Stony Brook University), Byron Wallace (Brown University), George Dietz (Brown University), and Peter Curtis (Ohio State). Our lab hosts [ Hojun Song ] for an IB departmental seminar. Marc gives an invited talk at the SPP 1399 Host-Parasite Coevolution and RCNE (NSF Research Collaborative Network in Ecoimmunology) symposia in Blossin, Germany. Lajeunesse Lab welcomes two new labbies: Ashley Lackey and Nick Ogburn! Marc gives an invited talk at the [Society for Research Synthesis Methodology ], in Providence RI. It was great to meet a few of the originators of meta-analysis [Ingram Olkin ] and [Frank Schmidt ]. Honors students Amy davis and Khaled Matar submit their Honors theses! Great job guys!!! Marc gives a departmental seminar at the University of Central Florida (Orlando, Florida). Our lab hosts [ Jason Hoeksema ] for an IB departmental seminar. Marc gives a departmental seminar in the Department of Global Health here at USF. 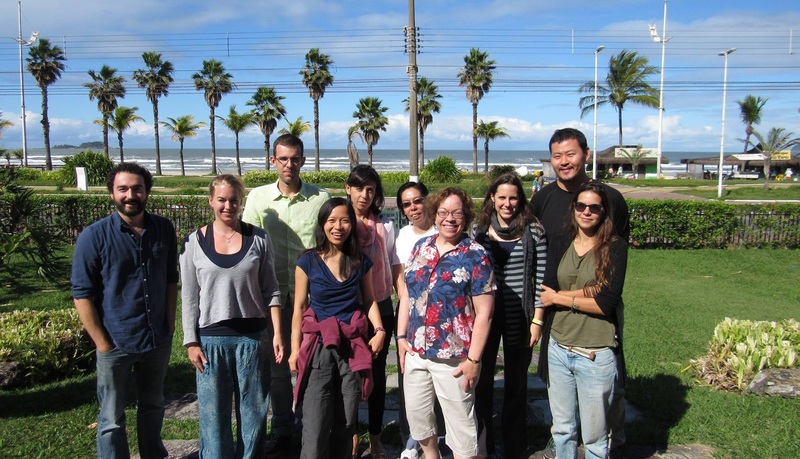 Our lab helps host Nobel Peace Prize winner [ Camille Parmesan ] for an IB departmental seminar. Labbie Jason Richardson is awarded a research grant from the East Texas Herpetological Society! Congrats again buddy! Masters student Jake Zydek joins our lab! Honors student Jamie Hodes submits her Honors thesis! Our lab hosts [Craig Osenberg ] for an IB departmental seminar. Our lab hosts [David Jenkins ] for an IB departmental seminar. Marc visits NESCent in Durham NC for a meta-analysis workgroup on mixed linear models. Our new postdoc Heather Jezorek joins the lab! 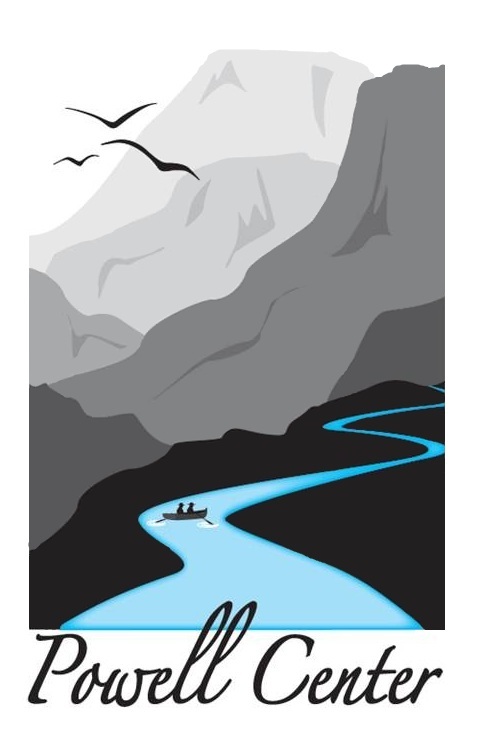 Our response ratio paper hits the November 2011 issue of [Ecology ]! What a fast turnaround! Our lab hosts [David Reed ] for an IB departmental seminar. A new version of phyloMeta is now available, see [ ]. Ph.D. and M.S. positions also available. See [Letter to prospective students ]. Labbie Jason Richardson is awarded a research grant from the USF Office of Undergraduate Research! Congrats buddy! Updated phyloMeta, see [ ].